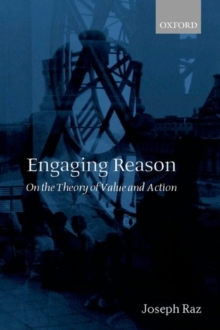 Engaging Reason offers a penetrating examination of a set of fundamental questions about human thought and action. In these tightly argued and interconnected essays Joseph Raz examines the nature of normativity, reason, and the will; the justification of reason; and the objectivity of value. He argues for the centrality, but also demonstrates the limits, of reason in action and belief. He suggests that our life is most truly our own when our variousemotions, hopes, desires, intentions, and actions are guided by reason. He explores the universality of value and of principles of reason on one side, and on the other side their dependence on social practices, and their susceptibility to change and improvement. He concludes with an illuminating explanation ofself-interest and its relation to impersonal values in general and to morality in particular. Joseph Raz has been since the 1970s a prominent, original, and widely admired contributor to the study of norms, values, and reasons, not just in philosophy but in political and legal theory. This volume displays the power and unity of his thought on these subjects, and will be essential reading for all who work on them.